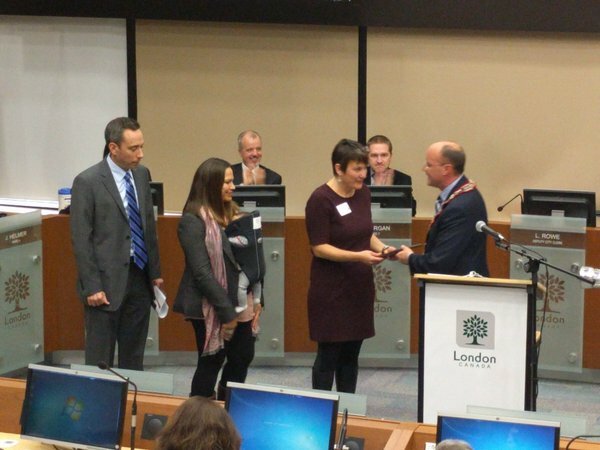 The Southwest Ontario Aboriginal Health Access Centre (SOAHAC) and the South West Local Health Integration Network (LHIN) are the proud recipients of the City of London’s Diversity, Race Relations and Inclusivity Award for the Indigenous Cultural Safety Training Program (ICS). The Award recognizes achievements that promote public awareness of initiatives on diversity, anti-racism, inclusivity and human rights and to promote London as a welcoming city. There are five award categories. ICS was the winner in the Corporation category. The ICS training program is a unique, facilitated online training program developed by Indigenous scholars and designed to increase knowledge, enhance self-awareness, and strengthen the skills of those who work both directly and indirectly with Indigenous peoples. The ICS program teaches participants about terminology, diversity, anti-racism, inclusivity, aspects of colonial history, such as Indian residential schools and Indian Hospitals, a timeline of historical events, and contexts for understanding social disparities and inequities. Through interactive activities, participants examine culture, stereotyping, and the consequences and legacies of colonization. This program addresses institutionalized racism within health care organizations. It is a process of re-education designed to break stereotypes, unconscious bias, and support a better patient experience for Indigenous peoples accessing services.